JustSingleParents.com is a versatile website for any single parent looking to try dating again. 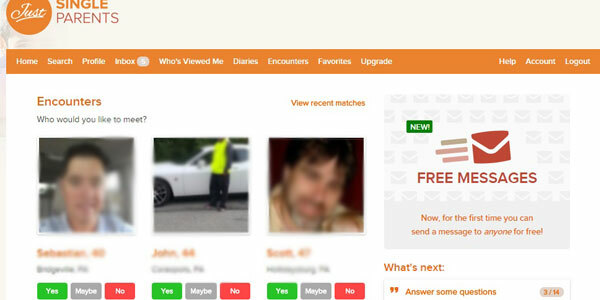 Visually pleasant and intuitive, even for those new to the online dating experience. The site lets you search for people you might like in your location, making the search easy and convenient. You can send messages or winks to other users without subscribing to a plan or paying any fees. However, paid users have access to increased features to help them make better connections, which we highly recommend. There are many different features to try out on this site. The Encounters section provides matches that the site thinks you might like, allowing you to easily accept, decline, or save them for later. If you don't have any matches you like, try searching the site with filters specifying your age, location, and photo preferences. Once you find someone you fancy, you can send them a message, wink, or add them to your favorites to keep tabs on them. If you're feeling up to it, you can even create a dating diary for other users to peruse and learn a little more about you. The online chat feature lets you instantly connect with other like-minded individuals if you're in the mood for some quick interaction. There's even an astrology section of the site that gives you your love forecast for the day. 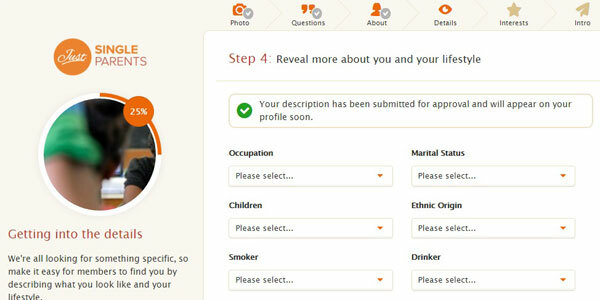 Finish completing your profile by adding a photo, answering a few fun questions about yourself, writing a bio, updating your personal details, selecting your interests, and creating a short introduction to your profile. In order for your account to be considered complete, you will need to open the verification email sent to you. JustSingleParents.com is secured by Online Dating Protector, which is a website dedicated to making dating sites safe for users. This service offers you the ability to report users who break rules, chat with a moderator if you feel threatened, and ask for dating advice from one of their seasoned professionals. They also scan the site looking for scammers to ensure each profile is legitimate and honest. This makes JustSingleParents an extremely safe place to take a chance on love. While many of the features of the site are free to use, there are some that require you to be a member to use, such as the dating diary and video profile. Luckily, there are several different subscription options to meet your needs. The one month subscription costs $19.95 per month and is billed as a payment of $19.95. The three month subscription costs $13.32 per month and is billed as a payment of $39.95. The six month subscription costs $10 per month and is billed as a payment of $59.95. The one year subscription costs $8.33 per month and is billed as a payment of $99.95. JustSingleParents is quite easy to use, as the formatting and layout of the site is clean and modern. All of your matches are displayed in the center of the member homepage, making it easy to see if you like any of the new faces. Across the top of the page is an uncluttered menu bar with all of the options you need for functionality. Scrolling down the page, a floating notification bar follows you to alert you of any new profile views, messages, and other updates. The intuitive look and feel of the site makes for a very pleasant experience for the user. Searching for a potential date couldn't be simpler. Simply click the Search link on the top menu, and you will be brought to a page listing some members located across the region. Narrow things down by typing in a location as well as setting an age limit. You can even limit your search to members who have a photo or are online right now. JustSingleParents.com is a site that prides itself on catering to single parents, and they deliver. The site offers a lot of perks that are available for free. While the full site requires you to pay, these extra features are definitely worth it and will add to the dating service provided, helping you find love again. However, if our JustSingleParents review hasn't convinced you that it is the dating site for you, we have another alternative. 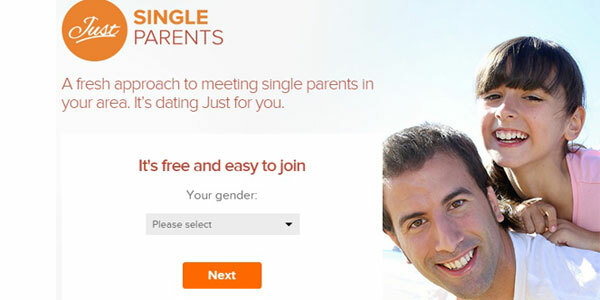 Check out our review of SingleParentMeet.com, another site where you can find a meaningful connection with other single parents.